As it seems that you can make millions simply by answering to the market demand, a printing business in Bangladesh is lucrative. In fact, it’s not only easy to start but has a higher demand as well. You’re simply ready to start when you have a printer, printing software for digital printing and stock-up. But, as we have searched the web and found out what the been-there-done-that experts’ sayings. They have said that “if you think printing business is easy, think again.” Also, the potential is still high because there are always needs for printing. It’s the business that still relies not only on brochures and business cards but banners and marketing campaign as well. And using both online, and offline methods, they still adopt a hybrid approach to marketing. So, it’s true that the opportunities are there. The first one of all is that the growing economy and the spreading usage of technology is the main reason to start a printing business in Bangladesh. Although the internet may be taking over many aspects of printing, some things are still preferred on paper. Some items are still popular in the paper, including banners, posters, manifestos, programs for special functions, birthday and holiday greetings. That’s why the demand of printing business will never get end rather than will increase gradually. For example, when they enter the church for a wedding, it’s not exactly socially acceptable to hand someone a laptop to look at. They’re becoming more popular those who have niche printers, who specialize in certain areas and create unique and interesting designs. 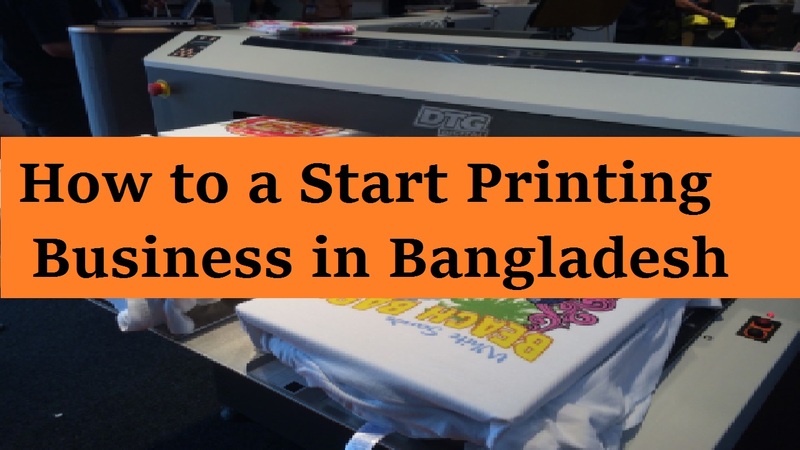 There are many budding entrepreneurs jump into the printing bandwagon as it seems easy to start a printing business in Bangladesh. But, many of them fail due to their misconceptions about the printing business unfortunately due to lack of proper steps. On the other hand, the business is complex and resource intensive despite ease of starting of the business. Well, let’s know the steps that you must follow to survive in the printing business in Bangladesh. If you want to run a successful printing business you need more knowledge, the ability to use Photoshop is useful but not enough. In this concern, you may even need to take design class and/or courses. Although hiring someone is costly, especially in the early stage of your business, surely you can hire someone with that knowledge. But, you need to strongly consider and re-consider if you are thinking about starting a printing business. Decide what size space you need and where you would like your business to be located based on the size of your new digital printing business and the range of services you will offer. If you’re going to be doing deliveries to businesses then you may want to be closer to the business district in your city. But, if you’re going to be doing large-scale printing then you’ll need to have enough space for bulkier equipment. That’s why remember that if it’s larger in space and closer to a central business area then it’ll be more expensive. Also, you’ll have to figure out how small you can go without sacrificing productivity, and think about how close into the city you need to be. After that comparing your needs, choose a space that fits them and your budget. Make sure your materials speak about the level of quality of your services when you begin to advertise. For example, either have a quality printer do them for you or print brochures and business cards yourself. Just you need to ensure that these are a sample of the work you would do for your prospective clients. Also, get in front of the decision and your target market and find unique opportunities. Moreover, in order to let area businesses and decision makers know about your services join local business associations and attend networking functions. In this concern, that who has digital printing needs is a potential client. For the small business marketing, networking has become the preferred mode. That’s why you should be sure that you’re taking advantage of every opportunity. When you’re in a printing business in Bangladesh, you must decide what services you are going to offer. This is because there are plenty from brochure and business card printing to T-shirts and mugs to large-scale banners, signs and even books. That’s why taking the right decision according to your skill and knowledge, you’re more likely to be successful in this business. Let’s take an example; you’ll need to purchase an embossing machine and/or hot-stamping foils if you plan on offering embossing services. Moreover, you can’t ignore knowing what services and products you are going to offer when you begin to market your business to prospective clients. When you’re at the initial stage of the printing business in Bangladesh, you may not be able to afford a lot of equipment. That’s why you can do one thing is to create a relationship with a local or Internet-based commercial printer. Also, if you will be selling banners and other large printed items, this is essential. But, you will be able to perform your duties with a computer and the necessary design software for smaller items.